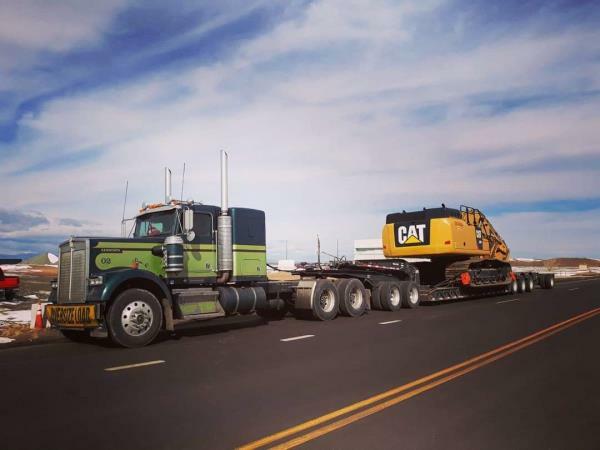 Re: So you want to haul oversize? The kid from Colorado got some skills and livin' the good life. Lots of people watched your come upance, the old school way, and I for one am pretty impressed at your passion and progress. Ryan is another one I've been watching, you guys didn't just hook onto a dry van and call it a career, you set the bar a bit higher and made the effort, as a result you are seen as pro's in the eyes of your peers. You know you're doing something right when you don't have to look for work, you just have to let a few people know when you're out of work and the phone starts ringing. 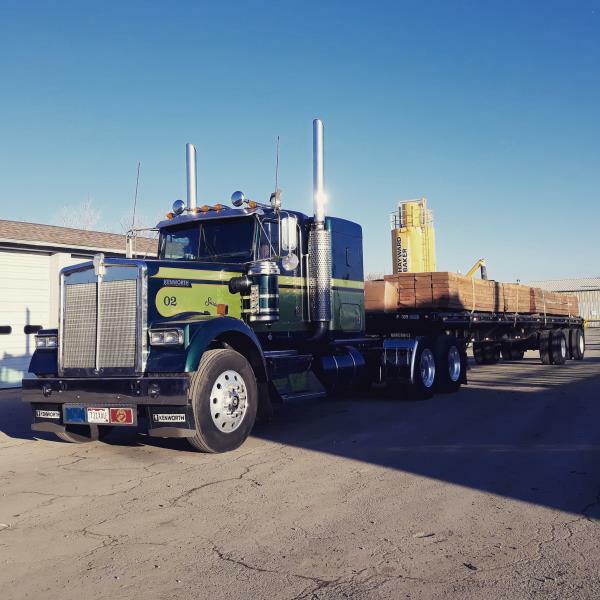 Yes, sir, indeed, that's a straight load of lumber on a spread axle flatbed. Lagging boards, specifically (for those unfamiliar with construction, lagging boards are the lumber slats used in foundation digs for new high-rises to hold up the foundation walls until concrete is poured). I genuinely enjoyed this load. It was nice to do something so... simple, for a change. The ancient Hanomag loader, again. I like this machine. It may not be new and shiny, but, its owned and run by a small businessman, an independent, much like myself. That hill tops out at about 11%. 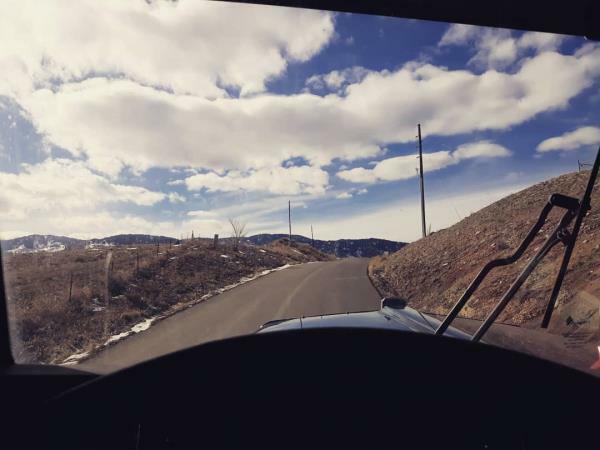 When pulling a gradient that steep and that heavy, you've got your power-divider locked in and drop into a gear she'll hold walking that grade. Don't even think about trying to shift. Take it slow and steady and you'll get to the top no problem. A little John-Deere 160G on the flip. Only about 90,000 gross. 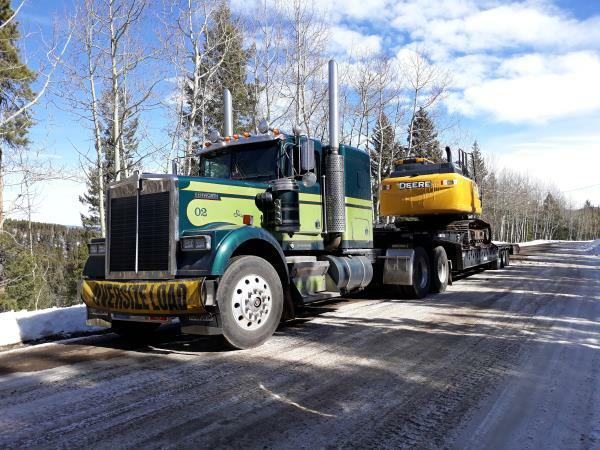 Loaded and moved on the side of a mountain for a high altitude home builder. A move only the big flip will do as the switchbacks on the mountain were too narrow for a lowboy to clear. 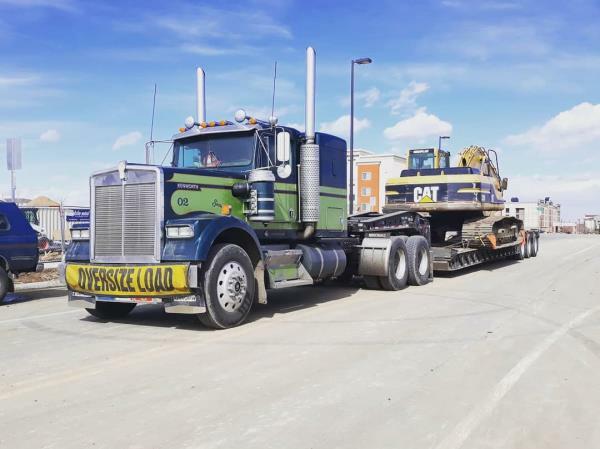 Speaking of tight spots, getting this 349F CAT loader out of a nice, narrow jobsite along a major demo project starting in Denver. Delivered safe and sound to Denver International Airport. About 170,000lbs gross. A seriously fun throwback haul. As many of you may recall, I got my start hauling oddball scrap iron and railroad equipment. I've been doing a bit more of the oddball scrap iron lately and ended up hauling this ancient radial drill-press into the crusher. 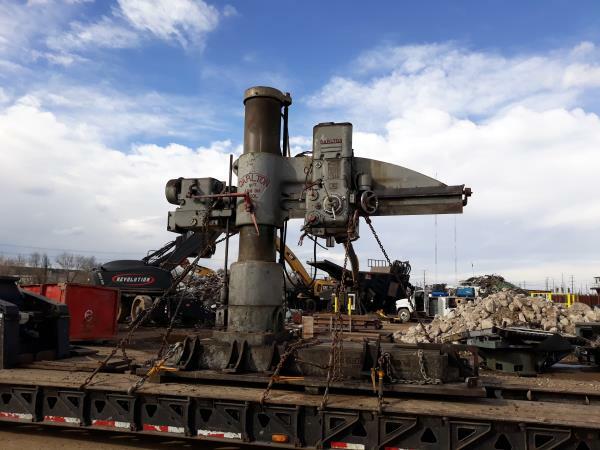 It's unfortunate that an old machine like this gets crushed, but, the local ironworks that owned it needed to rebuild it and no one could supply new bearings, seals, etc. For what it's worth, however, they are an American-owned, independent ironworks and are replacing it with a U.S.-made drill-press. It's been fun doing a bit of the oddball scrap work again. Ugly or pretty, if the freight pays, load it up! Fun with little iron. An older CAT 322B L, about 91,000 gross. Street loading and unloading over fresh concrete. With proper skills on a hoe and some junk lumber, by the time it was all said and done you wouldn't have known we loaded a 50,000lb excavator on the street! And then a rental swap-out on a couple ECR235el Volvo's. About 95,000lbs gross, these excavators weigh in at about 53-55,000lbs and are some of the largest rubber-track excavators on the market. Remember me describing loading the S190 McClosky crawler screen in 100-degree Summer heat following an immense hydraulic failure on the machine causing gallons of AW46 hydraulic oil to spill everywhere? Loaded it up again, this time on snowpack and ice. It did still have a minor hydraulic leak, though nothing like what had happened the previous time. Still, loading a machine like this on snow and ice still presents it's challenges. 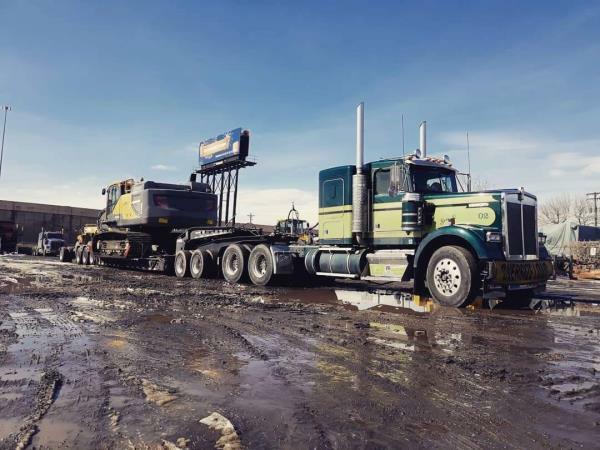 Foremost is finding as level of a spot as you possibly can to drop the lowboy and unhook the neck. It isn't that a machine like this can't be loaded on a side-slope, however, the slicker the deck becomes (especially when dealing with, even if minor, hydraulic leaks) progressively more dicey and unnecessary if it can be avoided. Under normal (i.e. dry) conditions you can load on a side-slope simply by off-setting the machine to the high side of the slope whilst walking onto the trailer and straighten-out once you're up on the deck. When working with a slick or wet deck, however, walking sideways once you're up on the deck can become exceedingly dangerous because the machine will already want to slide to the down-slope side. To handle this effectively you have to keep the machine moving forward during any side-to-side movements of the machine, otherwise the screen (or any tracked machine for that matter) can twist sideways making straightening it out significantly more complex. Keep in mind, this is on top of handling all of the normal loading procedures for a crawler screen or crusher. These machines sit exceedingly low to the ground and have conveyors and bins that stick out far beyond the primary chassis on either end. 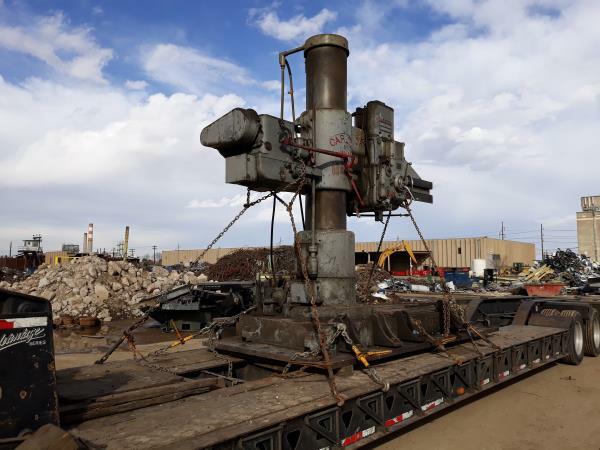 Virtually any crusher or screen requires building a significant ramp from sacrificial lumber to raise the machine high enough to clear the deck before it walks in. In its simplest form, loading these machines is an extensive and literal balancing act. Once loaded, and chained down, I got my shovel out... why? Well, as noted, we were working on snow-pack and ice that day. This meant that I had a limited traction situation getting the deck hooked up. With the extremely close clearances between the neck and the bin on the screen, getting hung up could mean a virtually no-traction situation trying to dig myself out. So, instead, shovel-in-hand, I dug ruts for the tires and the ears on the lowboy neck to ensure the neck dropped well below the bin getting hooked. Once hooked and the neck raised and I had weight on the suspension, I had little concern walking out of the pit with the snow and ice. 8 chains. Four to the main rails, four to the outer-rails, crossing. Keep the machine from being able to twist side-to-side. McClosky S190 5x20 crawler screen, 124,000lbs gross, 11ft wide, 15ft-4in tall on the deck, 8ft rear overhang. Speaking of wet weather, how about digging an ECR380el Volvo excavator out of an immense mud-hole? I keep some junky flat-boards on my lowboy for the purpose of street-loading steel-tracked machines to prevent damage to asphalt or concrete. When I arrived at this particular jobsite, about 2 days after a snow storm, the mud was grease, and the entry way was loose-pack riprap stone and a hollow cattle grate. I chatted with the jobsite super about potentially street-loading as they already had one of the lanes shut down on the street anyway. No go, the municipality had already been on them about tracking mud out, so, we had to find a way to load on-site. Wonderful... did I mention, shortly after the entry way to the site was an 8 foot tall berm of mud? Fun! Luckily, the jobsite wasn't running equipment in and out that day aside from me, so, blocking the entry-way, about our only real choice, was what we were going to do. Even so, it was far from ideal. Naturally, the mud had collapsed past the riprap, causing a deep gully to form. How deep? about a 12-inch drop in about 6 feet horizontally. When I pulled in, I locked in the power-divider, nosed further than I intended, and then set down my junky flat-stock boards behind my drives... why? The drives would land partially on the riprap where I would have to load. 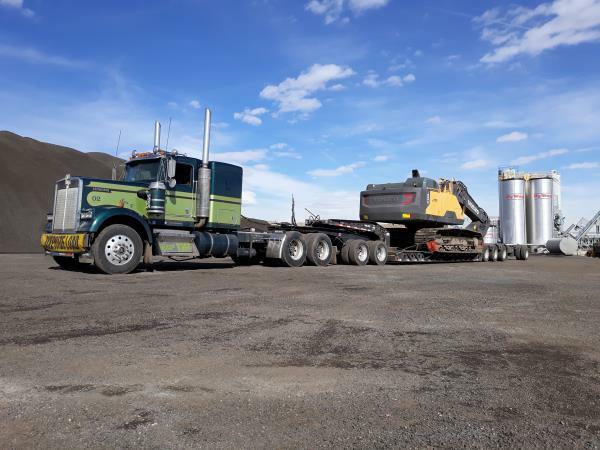 An ECR380el Volvo is as heavy as you'll get on six axles in Colorado, and I would be getting out of there with about 55,000lbs on the drives. That is sufficient weight to simply blow out a tire sitting on a sharp point of riprap. Also, setting the boards under my tires ensured I had some degree of traction. Oh boy, what a fun one this will be. Wood pads underneath the nose of the lowboy and the ramps to prevent them from getting stuck between the grates on the cattle guard, as well. I walked the excavator down off the berm, cleared the tracks of as much mud as I could, and then tracked onto the trailer, chained down. All of this being relatively straight forward. Before even hooking up, I hung all my signs, flags, made my measurements, etc. Once I was hooked, I didn't want the tires setting in that much further on the mud or loose riprap. Once hooked, we aired up and I maxed the lift cylinders on the neck. The lowboy was barely above the grate... Oh, by the way, I was going to have to blindside backwards getting out. Joy of joys! I released Suzie's brakes and let her roll forward into the upslope of the gully, locking my power-divider in. As soon as I felt the upslope pushing back and rolling me backwards I dropped her into low-reverse and started walking her back. She lugged, and lugged. It took several rock-n-rolls, and one full pull-forward, but, Suzie strutted her stuff, lugged, grunted, and then walked out of the hole, dragging the rails over the cattle grate. Don't try this one at home, kids. I've done a fair amount of work like this, but, it's a good way to snap an axle or crack a bull gear. It still spooks me doing it. Volvo ECR380el Excavator. 131,000lbs gross. 14ft-8in tall and 12ft wide. How bad was that drop between the riprap and mud? 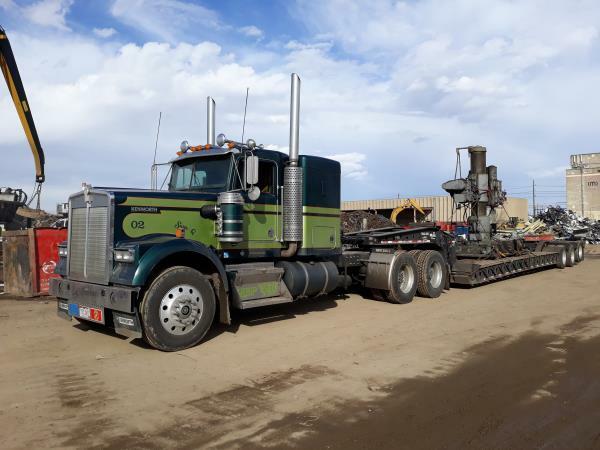 Take a look at the angle of the drives... and the lift cylinders are maxed out in that photo, with the deck of the lowboy maybe a 1/2inch above the grate. Want more? How about a 53,000lb Doppstadt SM-720 Trommel screen on a pintle hitch? When we need to move a pintle-hitch tow-away and don't have a truck available at the time with a pintle-hook, we'll use Big Ben, our old, mechanical fifth-wheel tow-unit (nope, not a fancy one like you kids have seen with the electrics and hydraulics, ours is totally mechanical). We'll drop a pintle-hook into it and go to work. This Trommel has always been a goofy one. Being designed for European roads, axle weights, and tractors, the axles are immensely far forward. So much so that about half of the weight of the tumbler unit sits behind the axles. On a pintle hitch, what that means is zero tongue weight. The trailer actually effectively lifts your drives up. It's slow going with this machine, even though you're only about 74,000lbs gross, as at about 50mph the trailer likes to start fish-tailing with all the weight cantilevered off the back. That fishtailing translates to the trailer steering your truck around. More or less, we move this piece at 45mph or less. No big deal, it's always short jumps and mostly on farm roads. FYI, that isn't mud or dirt I'm parked on... Trommel screens are used for compost production... and that's cow... droppings. Volvo A40G 40-ton haul truck. 107,000lbs gross, 12ft wide, 14ft tall. 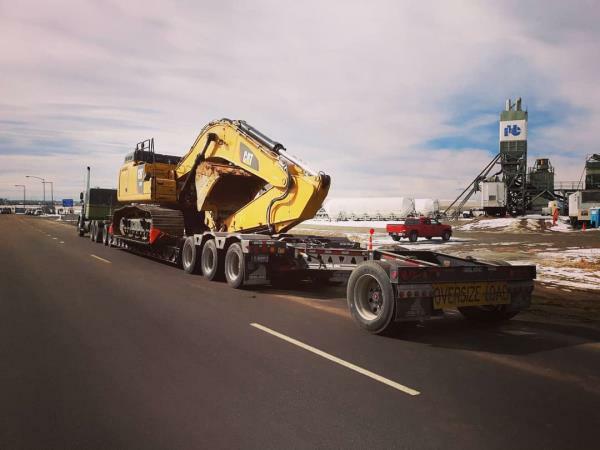 Volvo EX380D excavator loaded backwards. 130,000lbs. 14-6 tall, 12 wide. Great stories Troy, you sure know how to work your way out of some tough situations. Suzie's looking good too. 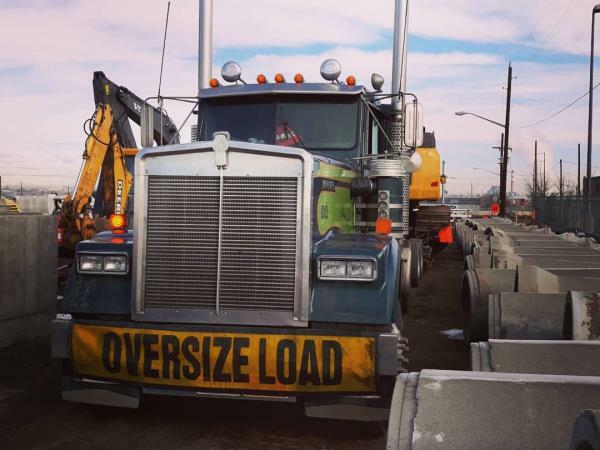 Curious how to load and determine where a machine sits on a lowboy? How about a simple tutorial! 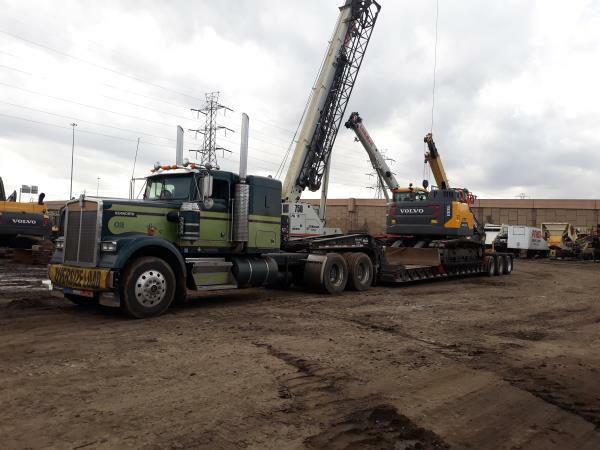 Loading a PC390lc Komatsu excavator today on Suzie, an 88,000lb machine, and maxing out how heavily I can load on six axles around the Mile High State... Start, obviously by dropping the neck, and setting outrigger boards. A PC390 will have less than half the track on the deck, and as a general rule, with 50% or less of a machine's track or tires on the trailer you'll swing out the outriggers. Line up and start walking the ramps. I've always had the habit of walking to the deck with the house swung a little sideways to line up as evenly as possible and then straighten out before walking the ramps. Eventually, as you walk up the ramp you'll come to a teeter point where the machine will balance itself on the break-over of the ramps to the deck. Mark your center point and now you know where your center of weight on the machine is (roughly the front of the lower bracket). Now, many newer machines like this one may have a small marking indicating the center of weight, but, most older or rebuilt/ repainted lack the center-of-weight marking. So, the next important factor is knowing the center of weight distribution on the trailer. 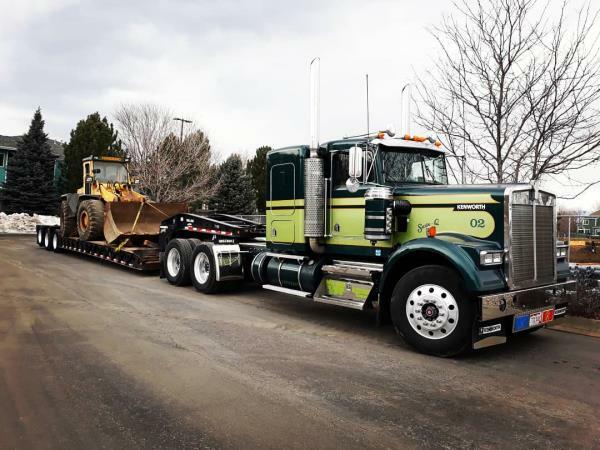 This will be, on a standard air-ride lowboy, half-way between the kingpin and slightly ahead of the middle axle. Keep in mind, the suspension type as well as adding axles like jeeps and stingers will alter the center-point for weight distribution. 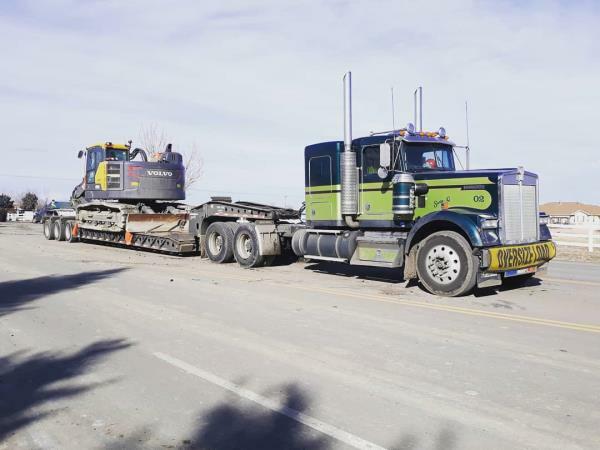 Seeing as we have a 3-axle grouping out back, and a 2 axle up front, we want to be behind center to get more of the weight on the trailer axles. About 2.5ft past the center point (approximately the middle turn-signal of the trailer). Hook back up, measure your height, chain down, and roll-on. Assuming you're not overloading, you should always be within spitting distance of your scalable axle weights and needn't move a half-dozen times times to axle out. ... and that's how it's done! Komatsu PC390lc-11. 14ft 5in. Tall, 130,000lbs gross. Can you also show how you would chain the excavator? I think there’s some differences on placing the bucket sometimes. Not on ice and snow, but, we have used the bucket on an excavator to push ourselves out of mudholes before. And, I don't get much into chaining because it is often a point of personal opinion and preference. Though there are some rules and guidelines about tie-downs, there is a lot of room for debate. There are drivers who would strongly disagree with how I run my chains off the tracks instead of from the chassis of the machine. Other's only believe in "rated" tie-downs like the D-rings. Simply put, that main-rail I have the 1/2in chain hooked to will handle far more pressure and pull than a D-ring. So, no, it's unlikely I'll discuss much about chaining, simply because what I do works for me, but, I'm not going to open a can of worms up for debate.